Once you’ve earned post-grad degrees in economics and finance, started a company representing international buyers, raised 2 children, and lived around the world — from India and Hong Kong to Minnesota and Weston — what do you do next? 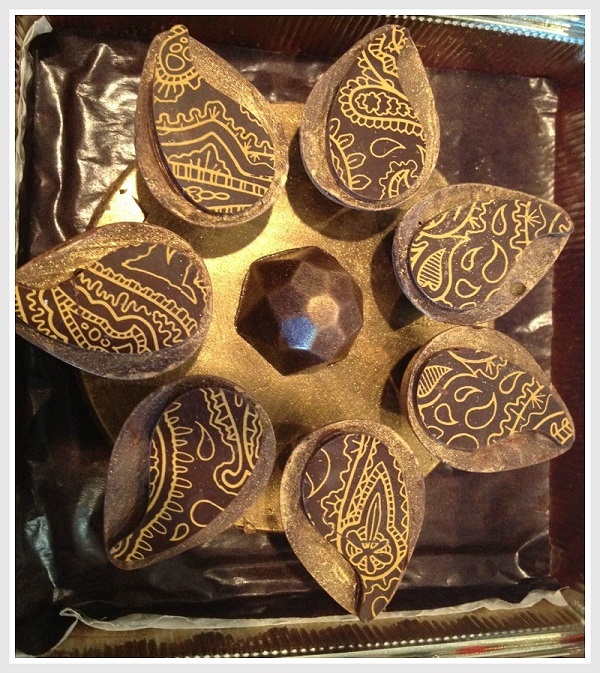 If you’re Aarti Khosla, you open a fantastic chocolate shop in Westport. 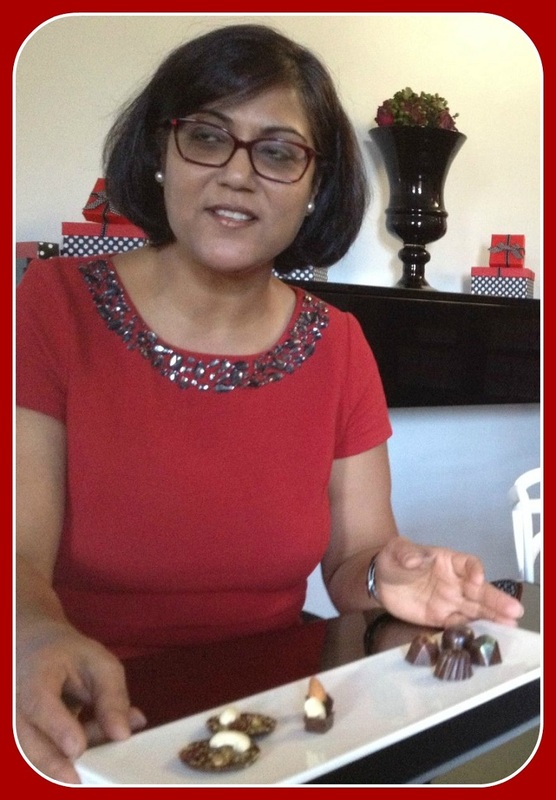 Aarti Khosla, in her red-and-black-themed chocolate shop. Le Rouge celebrates its grand opening this Friday (November 28, 11 a.m.-1 p.m.). Tucked away in a former optical shop below the old Sally’s Place (190 Main Street), it’s an intriguing — and different — addition to Westport’s retail scene. As is obvious from her bio, Aarti is a high achiever. She is detail-oriented. Her store is beautifully decorated, in red (her favorite color) and black (duh). She designed everything — from the decor to the gift boxes — herself. She makes, then brushes each creation by hand. She has spent the last 2 years learning everything there is to know about chocolate. She took online courses, and traveled to Vancouver to learn about coloring. A close-up of some of Aarti’s creations. Aarti drew on her international background — and love of cooking — to create delicate flavors. Her chocolates incorporate Szechuan pepper, wasabi ginger and apple pie truffle. (My favorite is saffron and pistachio in a white chocolate ganache.) She uses no preservatives or additives, and minimal glucose. Le Rouge’s market is world travelers, who appreciate artisanal flavors beyond Westport. Though most chocolates are taken home or shipped, Le Rouge is also a cafe. Aarti sells cappuccino, espresso (plus of course hot chocolate), and plated desserts. And — in a nod to 21st-century sensibilities that even the most traditional chocolate-lover could appreciate — there’s free Wi-Fi. This entry was posted in Downtown, Local business, People and tagged Aarti Khosla, Le Rouge chocolatier. Bookmark the permalink. Sounds great ! There goes my diet ! Ed, thank God a New Years resolution is within striking distance! Happy Thanksgiving! We stopped by and knocked on the door today- she graciously let us in. The chocolates are beautiful and everything we tried was amazing. The toffee was a favorite, as was the orange infused chocolate almond clusters. I loved the apple pie truffle.